Gallery of Contemporary American Art featuring original paintings, photography, folk art, hand-crafted jewelry and more. Seaside now has a new shoe shop in town. It's features all of your favorite styles -Birkenstock, Chaco, and OTBT, just to name a few. An exclusive boutique for both men & women. Featuring vintage and handmade clothes by a variety of designers including Tory Burch, Rebecca Taylor, French Connection, Michael Kors and more. Mercantile in Seaside is where the West meets the Beach! This boutique features American-made, earth-friendly, cause-related, well-worn and vintage-inspired goods for ladies and men. Great merchandise for an adventurous life. Specializing in SPF apparel, accessories & gifts, perfect for fishing, boating & outdoor activities. From swimsuits and sandals to boogie boards and skim boards, ONO Surf Shop has everything you need for a day at the beach! Shop Seaside! Visit our Seaside lifestyle store and pick up your Seaside apparel, keepsakes and more. The flagship store for Seaside style. “Simple, Timeless, Comfortable” styles for all your beach occasions. Find clothing, Seaside logo wear, toys and accessories for mom-to-be and baby, too. Seaside's original open-air market featuring fashion, accessories & shoes perfect for the ultimate beach getaway. The Kids collection of fun fashion features original graphic tees designed exclusively for Seaside® to complete the perfect beach wardrobe. Designer swimwear, clothing and accessories that capture the distinct spirit, beauty and lifestyle of the coastal beach towns along Scenic Highway 30A. Amoré By The Sea is an eclectic gift shop featuring antiques, furnishings, local art and jewelry. Bienvenue to our humble abode in Ruskin Place, brimming with Paris-inspired original art, home furnishings, gifts and accessories. Keep it simple! This store features apothecary, art, antiques, home décor and unique gift items. A small boutique portrait studio by the beach. You will also find fabulous gifts, accessories and jewelry at Focus! Casual ladies fashions, local art & beach chic accent jewelry and accessories. Charming record store featuring CDs, new and used vinyl, record players, guitar strings and accessories. A bright and whimsical shop– Duckies carries toys, clothing for kids and ladies, gifts, beach gear and more. Designer Wendy Mignot combines black pearls, gems, leather, skins, shells, fabrics, and precious metals into artistic hand-crafted jewelry items. Sundog Books is a family owned, independent bookstore located in the heart of Seaside, Florida. Local family-owned coffee shop serving fresh brewed coffee & tea. 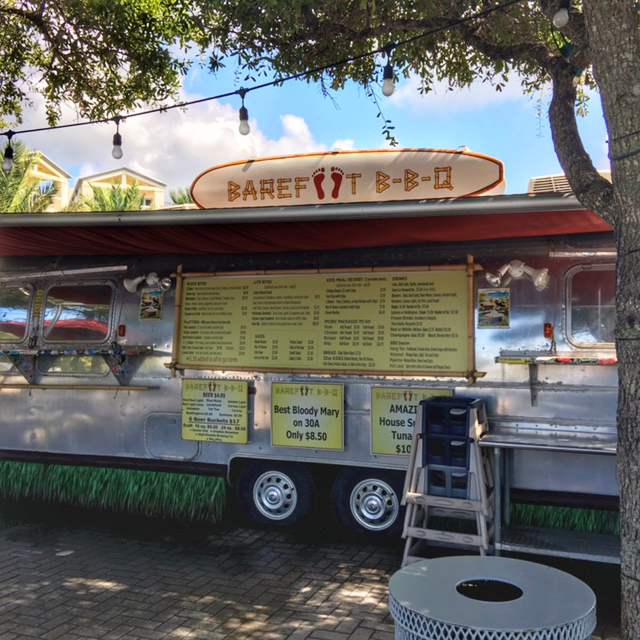 Barefoot BBQ is consistently voted as one of 30A’s hotspots for BBQ! Step right up to the food truck and order a slow-cooked pork plate or BBQ ribs! 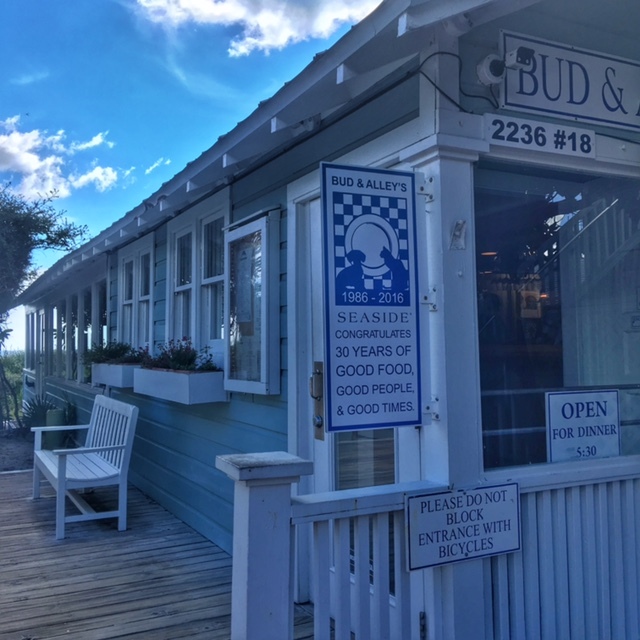 Founded in 1986 and named for a dog and cat, Bud & Alleys serves breakfast, lunch and dinner. Grab a cocktail and enjoy a beautiful cocktail over the Gulf at this iconic Seaside restaurant. Authentic thin-crust Italian pies featuring fresh ingredients and artisan cheese. Experience these Italian flavors in the courtyard and on the terrace overlooking the Gulf. Choose a colorful table and get ready to experience South-of-the-Border favorites and margaritas. Baja fish tacos, home-made burritos, chips & salsa and cold libations rule the menu. Fresh frozen yogurt, homemade fudge and kid’s candy. Enjoy a variety of sweet treats at Dawson’s! Step right up and pick your flavor! 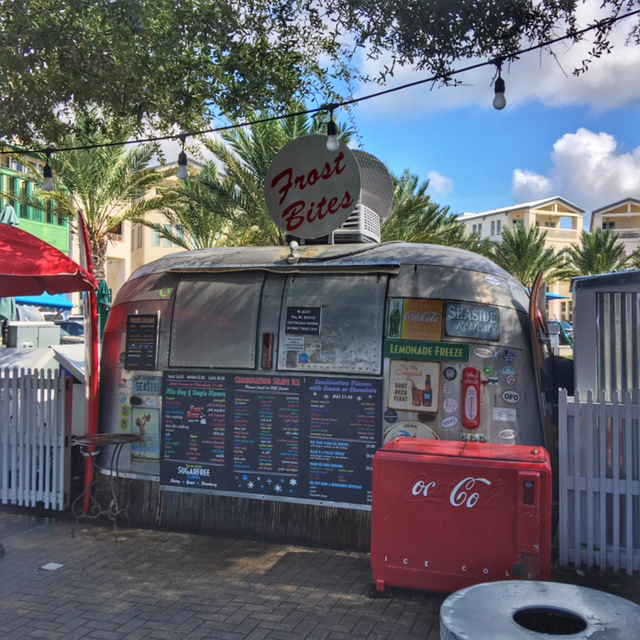 Cool off with an ice cold treat from Frost Bites! Serving Hawaiian shaved ice, homemade frozen custard, fresh squeezed lemonade and cold drinks. Southern cuisine. Serving breakfast, lunch & dinner. Featuring a raw oyster bar and a full bar. Offering a variety of gelato and sorbet flavors. Enjoy shakes, sundaes, ice cream sandwiches and strawberry shortcakes. Gourmet LavAzza Italian coffees and espresso. Get your Grilled Cheese fix at The Meltdown on 30A. Serving traditional and specialty grilled cheese sandwiches. 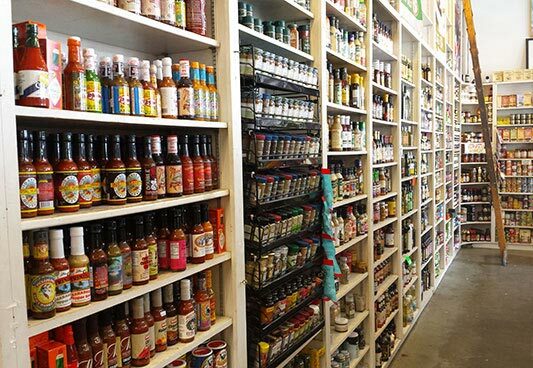 Gourmet and specialty market in Seaside. Breakfast, lunch and beach foods are available to go. Home of the best Fried Pickles you will ever taste! Pickle's Beachside Grill serves hamburgers, hot dogs and delicious signature sandwiches. Open for breakfast, lunch & dinner. 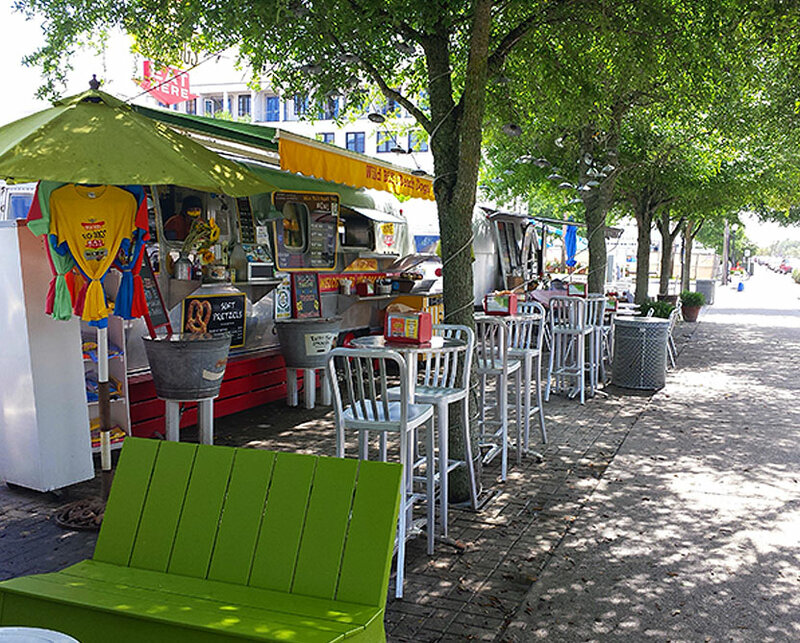 A taste of France comes to Seaside with Crêpes du Soleil. Le menufeatures delicious made-to-order crepes: either sweet or savory, classique or with a French twist, and their signature homemade mousse au chocolat. Be sure to grab a frosé or frozen lemonade. Bon Appétit! Get your fresh seafood fix at The Shrimp Shack! Try the fresh steamed Gulf shrimp or the half buttered lobster tail. Fresh oysters are also available. Best hot dogs on the beach! Enjoy dogs, sausages and brats– all antibiotic & nitrate free. Sip, savor, and socialize at this popular wine bar in Seaside. Enjoy wine and small plates in an intimate setting. Perfect for a date night with someone special or catching up with friends. Learn how to ride the waves like a pro! Spend the day pampering yourself with a massage, mani/pedi, facial or body treatment! Full service salon with extensive hair and beauty services as well as massages, facials, spray tanning and more. Planning a day at the beach? Cabana Man can help you with your beach chairs, umbrellas, kayak rentals and more.